So you and your friends either slayed an evil beast, or conquered the local warlord? Both? Well done, you! Time to celebrate, quaffing pints and regaling your friends with tall tales of your exploits over at the Red Dragon Inn. You goal is to be the last one standing among the carousing adventurers at the inn, which is not an easy feat when you’re subsisting on a diet of Dragon Breath Ale. Each player has a playmat that organizers the cards in play, and tracks both the character’s alcohol level, and fortitude. The goal is to keep the alcohol content low, and the fortitude high; should they meet, the character falls unconscious and the rest of the party splits the loot. Speaking of loot – should you run out of loot, the inn tosses you out on your heels. In either case, you’re out of the game. The last conscious player standing, with cash, is the winner. Sounds simple? It really is. The rules are single sheet of paper. They govern turn sequence (draw cards, play a card, buy someone a drink, quaff your next drink), and rules for gambling and passing around ale. Each turn, players play ‘action’ cards, to lower another player’s fortitude, or increase your own. And since the four characters have their own decks of cards, there are amusing personalized touches. Fiona the Volatile, for instance, likes to arm-wrestle, and takes umbrage at anyone giving her stick about her chainmail bikini. Zot the Wizard has his familiar, a charming bunny apparently summoned from “Monty Python’s Quest for the Holy Grail.” So when Fiona plays an arm-wrestling card that would cause Zot to lose a few points of fortitude, Zot has a card that shows Pooky (the alcoholic rabbit) counter-attacking. Some action cards initiate a round of gambling for simple antes. While all the action ensues, the serving wench dishes up a variety of brews, from light ale to troll swill. Each drink increases your alcohol level; sometimes only by one, others by three, plus a chaser. Sometimes it’s a grande cup o’joe that actually lowers you blood alcohol content. 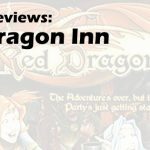 In the end, what makes Red Dragon Inn so much fun is that it’s the perfect counterpoint to all the serious RPGs we’ve all played. We’ve all sprinted out of the dungeon, away from the last enemy arrows, and wrapped up the game with “let’s head to the tavern.” We’ve never actually ‘gamed’ the tavern, until now. SlugFest Games knows how to make perfectly-balanced, fast-playing, and light-hearted fun games. They are rules-light because so many of the rules are concisely written right onto the cards. Players concentrate more on interacting with each other than on rules-lawyering their way through a 480-page rulebook and 60-page online FAQ. They zero in on the action on the table. And by staying within these limitations, SlugFest keeps the games moving, and keeps the fun focused. 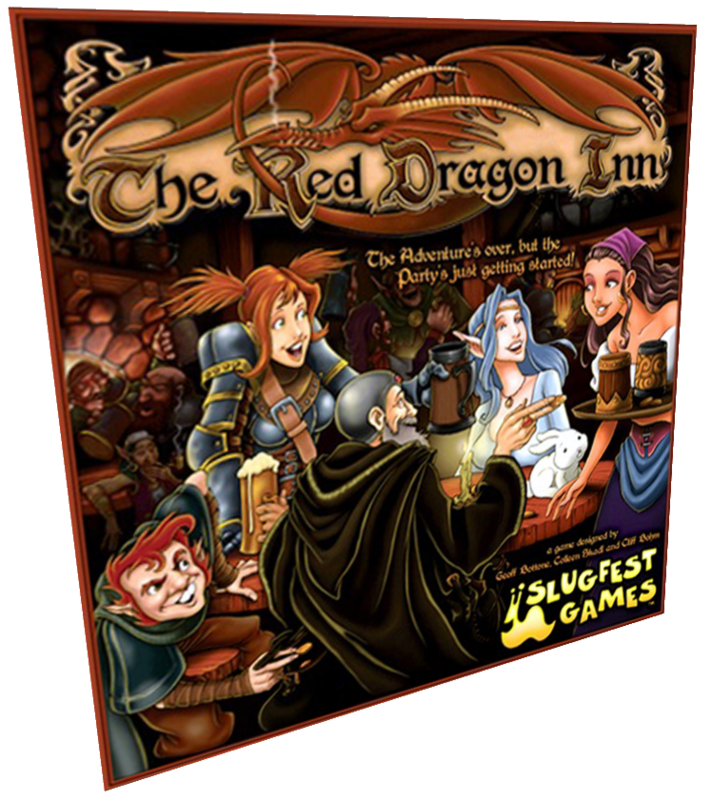 Red Dragon Inn really needs all four players to really max out the fun factor. It can be played with two or three, but seems a bit off-kilter when it is. And even if you’re the first person knocked out of the game, it won’t be too much longer before the next one’s ready to start. Earlier SlugFest games, such as Kung-Fu Fighting and En Garde have become evening staples on the after-the-convention-hall-closes circuit. Red Dragon Inn seems destined to follow. It’s easy to learn, fun to play, keeps everyone involved, and brings out laugh after laugh. And even though it’s best played with a full table, it’s unlikely you’ll ever lack for participants.